"The vast majority of students who voted in DePaul University’s student election last week were in favor of ending the sale of Sabra hummus in campus dining halls. 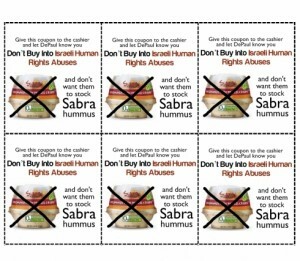 CHICAGO, IL (May 22, 2010)—Last week, DePaul University’s Student Government Association allowed a campus-wide referendum on whether or not Sabra hummus should be replaced with an alternative hummus brand in campus dining halls. The referendum was presented by Students for Justice in Palestine (SJP) and was the first to be placed on student government election ballot in at least ten years. CHICAGO, IL (May 15, 2010)—Students for Justice in Palestine (SJP) at DePaul University has been campaigning for the University to stop selling Sabra hummus products on its campuses. Two months ago, the Students for Justice in Palestine (SJP) at DePaul University called on the campus administration to remove Sabra hummus and affiliated products from school cafeterias.